“You’ve got pests.” Now What? The busy spring real estate market is in full swing. Buying a home, whether it’s your first or where you’ll retire, is an exciting time. There are so many things to think about. What will your design style be? Are you buying brand-new furniture, antiques, or taking whatever the relatives want to get rid of? Maybe there are still a few good years left in that particle board TV stand from college. Or maybe you’re down-sizing and trying to decide what to keep and what to pawn off on those first-time buyers in the family. While there are plenty of fun and exciting things associated with buying a home, there are just as many stressful situations. Getting a home inspection is pretty typical, but what if the inspector says, “You’ve got pests”? 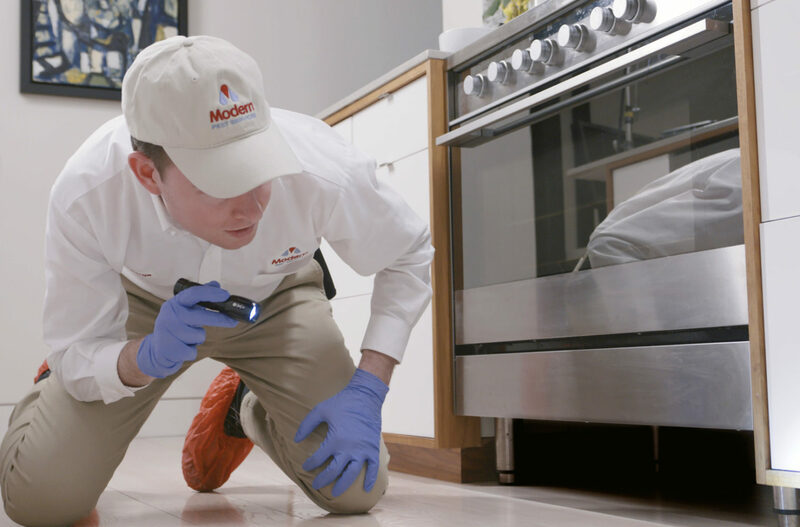 Calling Modern Pest Services to schedule an inspection is a great way to limit the damage and keep the deal alive. Ideally, this is something a seller would deal with well before the inspection stage. Getting a home ready to put on the market is enough work without the added problems of pest issues. Pests can affect your home inside and out. “I’ve had people want to stop the inspection right then and there when these things are found,” said Keri. Obvious damage from insects, rodents, and wildlife can turn off prospective buyers in an instant. “Nothing kills a sale faster than evidence of carpenter ants, powderpost beetles or rodents during an inspection,” she added. These and many other pests can put a home in peril. So what kind of damage are these critters doing to your investment? Carpenter ants are found both indoors and outdoors. They are named for their habit of excavating, tunneling and living in decaying wood. The tunnels they create to nest inside the wood create structural damage. They don’t actually eat the wood, though. Damage caused by carpenter ants is most likely to occur in areas where wood has already suffered moisture infiltration. It’s rare for the ants to attack dry wood. They chew and tunnel to create extensive galleries in the wood, which then serve as their homes. Carpenter ant galleries have a smooth interior that may seem as if it’s been sanded. This, along with the absence of mud and soil, helps to distinguish them from termites. The galleries may also have windows through which the ants enter and exit. Wood dust and debris are often found in piles outside the nest. In some cases, the wood on the exterior of the nest appears unharmed even when there is extensive damage beneath the surface. Termites cause more structural damage in the U.S. than carpenter ants and other wood destroying pests combined. The presence of termites is most easily identified by their damage. They go for the inside of the wood, so the damage has a distinct layered honey-comb look. But the damage isn’t obvious on the exterior of the wood. Mud tubes are an obvious sign of a termite nest. Termites demand a lot of moisture in their nests, and they construct these mud tubes from the ground to the nests they make in the wood of your home. This moisture can lead to mold problems in the structure of the house. Termites aren’t very picky, and will go after furniture, cabinets, floors, and windows made of wood. Wherever the termite damage is, you may also be able to pick up the scent of mildew or mold. Although the name “powderpost beetle” might not strike fear in the heart of a homeowner like “termite” does, it probably should. Powderpost beetles are the second-most destructive insect for wood behind termites. These small, brown insects are usually less than a ¼” long. They attack seasoned hardwood and are often discovered in stored lumber, rafters, joists, finished wood, and furniture products. They usually enter lumber while it is being stored and cured, then later emerge from the finished product. They get their name due to the fine, flour-like residue the larvae leave behind when they bore holes in wood materials. They can also be identified by the small, round holes through which the adult beetles emerge. If you purchase an antique with numerous holes for your new home, it’s a good idea to have the antique dealer give you a receipt from the company that performed the fumigation on the item. Fumigation is highly-effective in eliminating all stages of powderpost beetles, but will not provide protection from future attacks. When rodents want entrance to your home, they can be very persistent. A rodent can scale a vertical wall like a tiny, whiskered Spider-man, and can gnaw through just about anything with its two large incisors. Rodents also lack collar bones, which means if a rat or mouse can squeeze its head through an opening, the rest of its body can fit, too. Mice need only a dime-sized gap to squeeze through, and rats need only a nickel-sized gap. Once inside your home, a female mouse can birth up to a dozen mouse pups every three weeks. And while they might be kind of cute, rodents are known to carry over 35 different diseases. Mice droppings and urine can trigger allergic reactions. Rodents can also carry other nuisance pests like ticks, fleas, and lice. The damage rodents can do to the home you want to buy or sell can be significant as well. They gnaw on furniture, walls, and floors to create entrance holes. Insulation is chewed up to make comfy nests. And if they chew on electrical wires, they could create a costly and potentially deadly fire hazard. Wildlife like raccoons, squirrels, and bats can pose various problems for homeowners. Bats can gain access to attics and chimneys and cause structural damage. Their droppings also cause damage and can create a fungus that causes respiratory problems. Squirrels cause damage by chewing through siding, soffits, and gutters to get inside. They can also damage insulation, and create fire hazards by chewing on wires and other electrical components. Raccoons like to start their vandalism outside by getting into trash cans. Once inside, they’ll also leave harmful and odorous droppings. Damage to insulation can be significant, as they trample, compress, and move it to make nests. This can result in higher heating and cooling bills for a homeowner, and costly repairs. These little bandits also like to damage the ventilation and electrical systems that run through attics. This can lead to water damage, mold, and dangerous fires. When you’re buying or selling a house, dealing with pests is the last thing you want to add to your lengthy to-do list. That’s where Modern Pest Services comes in. Modern’s Homecare Green program protects against 60 pests year-round, including carpenter ants and rodents. Modern Pest also offers a separate and comprehensive termite treatment program using the Sentricon® Termite Colony Elimination System with Always Active™ technology. Modern Pest’s Wildlife Animal Control program covers bats, squirrels, raccoons, and several other nuisance animals. Pests and bugs are determined to find a way inside your New England home in search of food, water, and shelter. They might be there already. At Modern Pest Services, we want to help make buying and selling your home as stress-free as possible. Let us worry about the pests. Then you can concentrate on other important things, like which curtains best accent your particle board TV stand. Don’t do it alone, contact Modern Pest Services today!